While completing all the household chores all by yourself on weekends, you must be thinking that there should be some gadget that could help you with these endless tasks. Right? If this thought crosses your mind frequently, then it is the right time to switch to a smart home. A smart home is equipped with lighting, heating, and electronic devices that you can conveniently control with a smartphone or computer remotely. Some decades ago, the ‘smart home’ was just a concept that was merely part of fiction novels and sci-fi movies. With the advancement in technology, this figment of imagination has turned into a reality. Automating your home or converting it to a smart home is exciting as you get an opportunity to renovate your home with gadgets whose applications are virtually unlimited. In your smart home you don’t need to control lighting fixtures, climate control, entertainment components or any other application individually. You just need to program the concerned device once and the rest will be automatically taken care of. In case you want to change the configuration just integrate the device with your smartphone, tablet or laptop. Home automation systems not only help you with home management but also extend a safe boundary around your residence or business. Security systems include control panels, keypads, sirens, locks, lights, access controls and more. You can select from a perfectly tailored integrated wireless system or opt for the wireless version of a security system. Sirens are the best way to scare away intruders and inform your neighbors about theft or an unauthorized entry in case of your absence. In your smart home, you also have the liberty to control all the lock systems irrespective of your location. The security systems are equipped with motion sensors that notify you regarding any entry within the boundaries of your property. Additional features like light sensors detect when it is dark and switch ON or OFF the light whenever needed. If being the life of the party is all you want, then a smart home is just what you require to dazzle your guests. Smart audio system revamp the whole meaning and feel of entertainment in your house. With smart music systems, you get the power of creating the same ambiance in each and every corner of the house with a single device to control all applications. To make the atmosphere more lively, you can choose from in-wall speakers, ceiling speakers, surround sound or sub woofers. As every electrical appliance is controlled with machines, you get to save greatly on energy consumption and bills. So, a smart home is not just a luxury but a smart need of everyone. Renovate your existing house to make your home an epitome of convenience, comfort and ease. Summer is fast approaching. Although our Colorado weather has been mild and cool thus far, long & hot days will be upon us. Of course, we all want to keep our homes & families comfortable this summer. Let’s examine how we can do that through ceiling fan installation. Why ceiling fan installation instead of air conditioning? The Department of Energy estimates that 48% of your energy expenses are spent on heating & cooling. If you use air conditioning, a ceiling fan will allow you to raise the thermostat setting about 4°F with no reduction in comfort. In temperate climates, or during moderately hot weather, ceiling fans may allow you to avoid using your air conditioner altogether. The World Health Organization (WHO) recognizes that natural ventilation, which includes outside air flowing through a building, is important for infection control. Indeed, WHO guidelines published in 2009 encourage use of such natural ventilation as an effective measure in reducing the risk of infection at health-care facilities. A fan consumes very little energy compared to actual air conditioning. If running a fan provides the comfort you need, then it is going to be more economical. Ceiling fans operate by creating a wind chill effect – this will make you more comfortable in your home – even if it’s also cooled by natural ventilation or air conditioning. Ceiling fans are the best type of fan for your home. They circulate the air in a room to create a draft. Ceiling fans are appropriate where the ceilings are at about eight feet high. Fans work best if the blades are 7 to 9 feet above the floor and 10 to 12 inches below the ceiling. Fans should be installed so their blades are no closer than 8 inches from the ceiling and 18 inches from the walls. A more expensive fan that operates quietly and smoothly will probably offer more trouble-free service than cheaper units. Ceiling fans labeled with ENERGY STAR® move air 20% more efficiently. In summer, the fan’s direction of rotation should be set so that air is blown downward (Usually counter-clockwise from beneath). The blades should lead with the upturned side as they spin. The breeze created by a ceiling fan speeds the evaporation of perspiration on human skin, which makes the body’s natural cooling mechanism much more efficient. Since the fan works directly on the body, rather than by changing the temperature of the air, during the summer it is a waste of electricity to leave a ceiling fan on when no one is in a room. Wire Works Co Inc provides electrical wiring in Colorado Springs, Colorado and the surrounding areas. Give us a call today – our specialized consultations can take your electrical wiring projects –including ceiling fan installation, security system installation, home automation & home theater — to the next level. 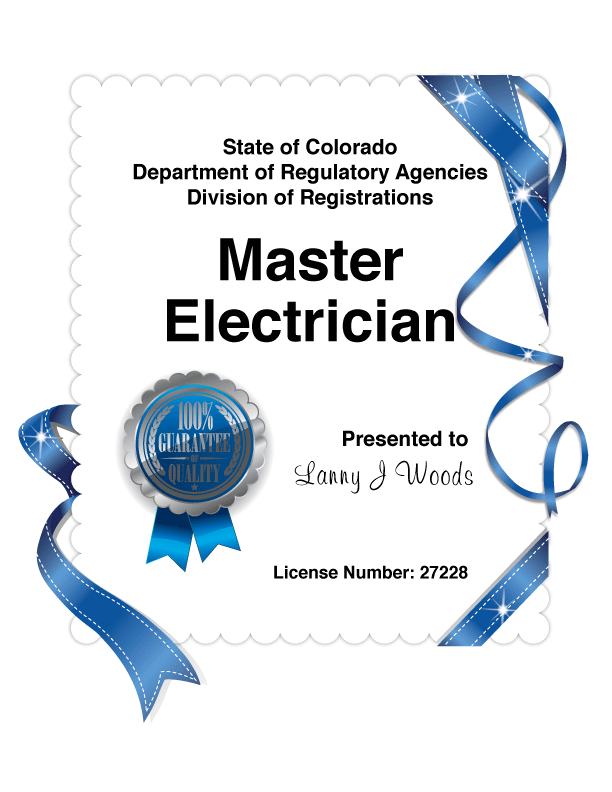 Our electricians are certified and hold all proper licensing & insurance. Electrician Certifications – What do they mean for electrical wiring? 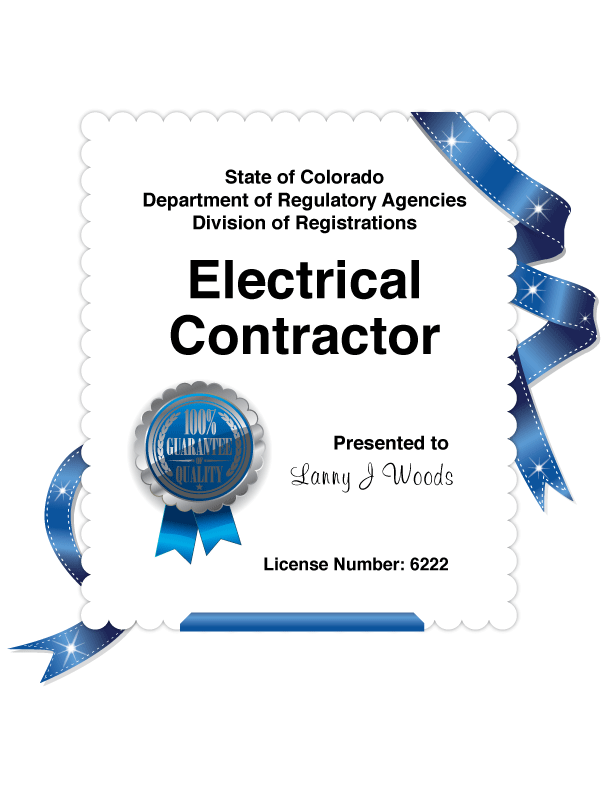 On April 6, 2015 / Blog, Colorado Springs, Electrical Wiring / Comments Off on Electrician Certifications – What do they mean for electrical wiring? Electrician Certifications – What do they mean? An Electrical Contractor or a Master Electrician installs and maintains electrical power, lighting, communication and control systems in homes, offices, businesses and factories. An Electrical Contractor would work on building a home theater, maintain electrical wiring install home automation or help with home theater installation. A Master Electrician directs and trains other electricians to install, maintain, or repair electrical wiring or equipment. He manages a team of electricians, studies blueprints or technical diagrams, identifies any electrical problems, and replaces electrical wires or rewires a building. An electrical contractor or a master electrician will have a comprehensive understanding of the state and local building regulations that are based on the National Electric Code. Electrical contractors may work alone, or collaborate with other professionals such as architects, civil engineers and building contractors. They may work with specialists such as elevator installers, and heating and air conditioning workers. What is the Minimum Qualification required to be an Electrician to work on electrical wiring? In almost all states, electricians need to be certified. But before that, a prospective electrician must have earned a high school diploma or its equivalent. They should have taken 1 year of algebra in high school, pass an aptitude test and a drug test. After completing their initial training, electricians may be required to take continuing education courses. These courses are usually related to safety practices, changes to the electrical code, and training from manufacturers in specific products such as security system installation, building a home theater or home automation. Electricians are required to get certified even if they are trained through apprenticeship programs under electrical contracting companies that are sponsored by local unions or national associations. Aspiring electricians may join a certificate program before or during an apprenticeship with an electrical contractor. An apprenticeship program may take 4 to 5 years to complete. During an apprenticeship program, electricians must complete a minimum of 144 hours of technical training and over 2,000 hours of on-the-job training. An electrician certificate program is quite comprehensive and covers maintenance and installation of residential, commercial and industrial electrical systems, with a special focus on safety procedures. An electrician certification program takes a year to complete. In a typical certification program, electricians receive training in the National Electrical Code, study electrical wiring, safety practices, reading blueprints, mathematics and so on. On completing the apprenticeship, electricians-in-training should get certified by passing the state licensing exam. Getting certified is absolutely critical for electricians. All states require electricians to take the state licensing exams and be licensed before working as professionals in the field. For more information on this, get in touch with your state electrical licensing board. What Can You Expect in a State Electrical Licensing Exam? Electricians can get certified only by passing an electrical licensing exam conducted by their state board. In a typical licensing exam, electricians will be tested on their knowledge of electrical theory, national and local electrical codes. Some states require electricians to get a master electrician certification for specialized electrical work. It is important for electricians to have gathered sufficient work experience to become eligible for an electrician certification and licensing offered by their state. Wire Works Co Inc provides electrical wiring in Colorado Springs, Colorado and the surrounding areas. Give us a call today – our specialized consultations can take your electrical wiring, security system installation, home automation & home theater to the next level. Our electricians are certified and hold all proper licensing & insurance. Security systems can help you safeguard the people you love. For most, security is linked to their home & business. These are places where we are meant to be able to relax, work hard and enjoy life. An important key to safeguarding those vital aspects of happiness is security system installation. Security lighting is critical to security system installation and deterrent systems. A thief will think twice before entering a well-lit area because he is afraid of being seen. Invaders are prone to operate in the dark – doors & entrances should have adequate lighting to establish safety. In contrast to small patches of high-intensity lighting, a wide distribution of low-intensity lighting is better since it will not create blind spots for CCTV cameras and security forces. One major aspect of security lighting installation is ensuring that it is troublesome to tamper with the lights – for example, placing them high off the ground. In addition, security lighting must have adequate backup power. Surveillance is the second key to security system installation. Through surveillance you can monitor the behavior and activities of people. This is for the purpose of protecting your family & assets. Surveillance is essential to security – the Police can use your surveillance for the prevention of crime, the protection a person, or the investigation of crime. Alarm systems are paramount to detection – they will alert security personnel when unauthorized access is attempted. Detection systems can be configured to include motion sensors. A loud, audible noise like an alarm acts as psychological deterrent – it notifies burglars that their presence has been detected. Video surveillance can also provide perceived security – a highly visible camera will deter intruders. In addition, surveillance cameras can be used for verification that alarms have actually triggered. They can be monitored & used for historical data gathering purposes – like turning the video over to police. Although CCTV has been traditionally used for video surveillance, this type of camera is giving way to camera networks operated over the internet. Wire Works Co Inc installs cameras that are affordable. They can be viewed remotely by you, anytime, anywhere. You can easily have settings for when you are away from home, for any length of time – daily, short vacations, or for extended periods. Access control allows you to monitor and control traffic through your building. This is accomplished with video surveillance, ID cards, & electronic locks, doors & gates. A security system installation is incomplete without locks. Locks control entries through a door or gate. Electronic “keys” can be manufactured to allow access to certain people, and they can even allow access for certain days & times – Monday through Friday from 9am to 5pm. Wire Works Co Inc provides security system installation in Colorado Springs, Colorado and the surrounding areas. Give us a call today – our specialized consultations can take your security to the next level. Home theater installers & HDCP 2.2 – Why do you care? On March 10, 2015 / Blog, Colorado Springs, Home Automation, Home Theater / Comments Off on Home theater installers & HDCP 2.2 – Why do you care? How can a seemingly random string of letters & numbers affect your home theater? When building a home theater, you should be knowledgeable about the latest security standards & how to ensure your videos, games & audio operate at premium levels. HDCP 2.2, or High-bandwidth Digital Content Protection version 2.2. HDCP is digital copy protection. In brief, this protocol prevents copying of digital audio & audio content. Are your 4K switches HDCP 2.2 Compliant? If you want to connect multiple screens to a device; for example, a bar with several televisions connected to one satellite receiver or when a user has a closed laptop and uses an external display as the only monitor. Video games can become latent because of additional processing power required. Live streaming or capture of game play is also adversely affected. All Apple laptops, if they are confronted with HDCP, automatically switch all output from the DVI / Mini DisplayPort / Thunderbolt connector port to be HDCP compliant. If the user then wishes to record or use videoconferencing programs, these are inherently forbidden by HDCP. HDCP 2.2 is a physical chipset. Only NEW chipsets can support 2.2 – existing chipsets cannot be upgraded with firmware. HDCP 2.2 is a requirement for any source device delivering HDCP content at 4K UltraHD resolutions. It’s important to research your products of choice and make sure they’ve been designed to work with future technologies, especially when researching & building a home theater. Give the quick summation. What do I need to do? Wire Works Co Inc., a reputable home theater installer in Colorado Springs, relies on research into HDCP and other current technologies. Use our services – your technology will function quickly and efficiently. Video games will run smooth, lighting will adjust automatically and sound systems will deliver a beautiful resonance. Find out more about our home theater installation services in Colorado Springs. Contact us today to set up a consultation & receive a written estimate. Where would we be without all the conveniences of modern technology? To take advantage of these benefits we have computers, laptops, tablets, iPods, iPhones, copiers, fax machines, cameras, game boxes, etc., etc., etc. These have long since switched from luxury items to necessities. Unfortunately all of these desirable components draw a lot of electricity. They are often referred to as vampire loads – running 24/7. Your docking station may get more traffic then the airport! In a county where we are trying to reduce our carbon footprints, it’s important to look to the future so we can have the power we need when we need it but with as little damage as possible. Having up to date wiring, panels, switches, and eco friendly lighting goes a long ways to using the energy where we need it and saving it where practical. Let’s keep progress moving in the right direction. Forward! while leaving as small of a wake in its path as possible! 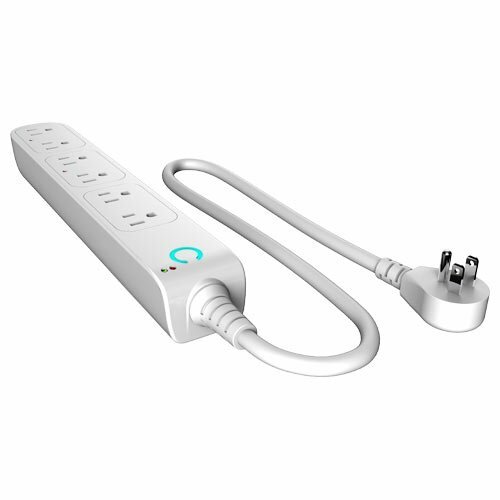 Smart Switch allows you to track how much energy you are using as well as turn off load usage when not in use.